I was never formally diagnosed with postnatal depression but the signs were there. My twins were born 8 weeks prematurely by emergency c-section rather than the natural delivery I had planned and they had to spend their first 6 weeks in special care. 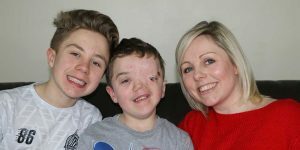 Twin two, Harry, had been born with a rare craniofacial condition which meant the left side of his face had never developed and he spent his first week of life miles away from me in a different hospital. Neither boys fed well from me, Oliver was so small. Harry was unable to latch on or breathe properly while I fed him. I struggled to cope with it all. On the outside, I smiled but internally I was shutting down. Feeling increasingly detached from a life that felt like someone else’s nightmare and utterly consumed with guilt and grief. I was offered no support from professionals and some even made my mental state worse over the years. My mum tried in vain to get me to see that I needed help but ‘people like me’ don’t get depressed and I certainly wasn’t going to admit defeat by taking ‘happy pills’. I was sure my feelings of isolation and darkness would pass in time. They didn’t. After my marriage broke down and I came to the conclusion that the world would be a better place without me in it, I finally gave in to my mum’s pleas and made an appointment with the doctor. I was prescribed anti-depressants and they literally saved me. My outdated and damaging views of mental health being something you could ‘snap out of’ were challenged and altered forever (thankfully) and I do believe that I am a better person for working through it all but I know I would probably still be trapped in that small-minded narrative that mental health is something that can be dealt with on your own, had I not faced a very different reality. Today, I wanted to share a few other stories of mums (and a dad!) who have struggled with postnatal depression. The indicators for them that something was wrong and what they did about it. I feel that only by talking about it can we lift the stigma and shift perceptions from ‘admitting defeat’ to ‘supporting strength’ in seeking support. Emily Peacock I thought I had escaped postnatal depression (PND), but when my third was 6 weeks old it crept up on me. I felt out of my depth, unable to cope and my anxiety was sky high. I did the questionnaire with my health visitor and realised I was suffering, so I took myself to the GP. I was prescribed antidepressants, and also signed up to online CBT (cognitive behavioural therapy) too. It was an incredibly hard few weeks (the first week on my medication was the worst of my life), but it was the best decision I ever made! Six months on I feel happier than ever, and my life is completely back on track. I am SO glad I recognised the signs early and sought help, as it made such a difference! My biggest piece of advice is to not suffer in silence. Talking is the best therapy. And having that support from family, friends and online makes the world of difference. Lyndsay-Rose I developed PND after my eldest. It pretty much started as soon as we were home from the special care baby unit. I knew I had PND and refused to do anything about it, mostly denial until she was nearly 2 years old. I was so up and down in my behaviour. I broke down shortly after my dog was found dead in my bathroom. My college friends made me book the doctors appointment. He put me on anti-depressants for a short while, which really helped, but took a while to kick in. I told my friends who told me they already knew and supported me throughout. Seeking help was the hardest step but equally the best decision I made. Sophie I struggled with PND after both of mine. It was a mixture of mental and physical health and hormones. Exercise has always helped me greatly so getting out for walks in the fresh air. Going for a coffee too helped. But I needed medication and mental health support team to properly sort me out. Laura I have been on antidepressants for 21 years now although my dose was increased when PND hit after my first child was born 14 years ago. Ultimately, it resulted in me being committed to a mental health facility. I don’t think it was purely medication that helped me though, more a mixture of therapy, acceptance, and reaching a point in my life where I wanted to be the best version of myself for my children. I’m not “cured” by any means and will take antidepressants for as long as I live, but I am happy and healthy and in no way ashamed of living with mental illness. I’m a stronger, and better, person for it. Julie My postnatal depression started after my first (and only) child. For me, my PND made everyday tasks really difficult and looking after my myself became impossible. It took all of my energy to care for the baby then I had nothing left for anyone. I felt like I was really here, not living, just existing. Secretly deep down I knew I had PND but I didn’t get help until my little one was 18months old. I was scared that everyone would think I was a bad mum and that they’d take my baby away from me. Nothing could have been further from the truth. Everyone was very supportive. The doctor prescribed me antidepressants which are amazing! My biggest tip for anyone struggling with postnatal depression is to speak to your doctor. It’s the hardest step but it’s important to get the help you need. Also, do find others who have had it to talk to – whether it be online or someone you know – talking with others who have been there and recovered really helps, as you get to see it will get better for you too! Sarah I was diagnosed with PND and anxiety after my 2nd child. I’d had PTSD after my first but it wasn’t until I was pregnant again that it was diagnosed and by that point I was already struggling. 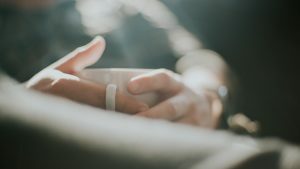 After my 2nd labour I tried to talk myself around when the feelings of inadequacy and dark thoughts started happening but as they progressed things escalated and I found it hard to leave the house and was convinced something would happen to my husband and/or children when they did too. I was sure everyone would be better off without me. I lost my entire friendship circle when they treated me really badly after my then 2yr old was struggling because of all of the changes and this led me to become even more isolated. It was during a routine checkup with the nurse when Charlotte was 6 weeks old and I broke down that I was sent straight for therapy and had a few months of CBT along with self-help techniques such as mindfulness, taking a vitamin D supplement, walking in the fresh air every day, trying my best to make new friends and joining my local PANDAS support group. I’ve really had to work at it – I have more good days than bad days now but it is something I still struggle with and I’m looking into paying for private counselling sessions to help. My CBT therapist did say that I’ve got to stop thinking that one day I will be ‘cured’ – she said I will probably always struggle, but the key is to make sure I have processes in place to recognise when it is starting and what to do to minimize the effects on me and others. I am more self-aware now and a bit more clued up on my triggers and also behaviours that are a warning sign that I’m slipping a bit – so in that respect it’s been really helpful. Rachael I had PND after my first child. It started around 2 days in and lasted until he was about a year old and was more “person” than baby. I knew I had PND because I just couldn’t cope, I didn’t cry hysterically & I didn’t resent my baby, but I was just incredibly numb. Nothing made me feel better. Nothing made me smile. Nothing made me laugh. I was completely incapable of showing any emotion towards my baby even though I knew I loved him. I went to the doctor a few times and they told me to practice mindfulness and they’d put me on a waiting list for CBT which never happened. My doctors all knew I was at high risk of having PND because I had previously been diagnosed with anxiety and depression, so I don’t know why they refused to prescribe me antidepressants. I was also struggling massively with breastfeeding and feeling like I had no identity anymore. I recently spoke to my health visitor all about this as my second is now 9 weeks old and I haven’t experienced any PND at all. 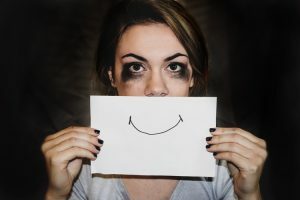 She described my depression as “true depression”, the numbness…not wanting to get out of bed/go to work/see anyone and unable to pull yourself out of it. Eventually, My firstborn started becoming more of a little person and I was able to see his personality shining through and he was less dependent on me, which slowly pulled me out of it. I DEEPLY regret not pushing for antidepressants and therapy because I missed out on the whole first year of my kid’s life. Ross Hunt Charlie Beswick I had it pretty much straight away with our first child. For me, I felt like I had no bond with her. Eventually, I started to dislike her, I was sometimes jealous, I regretted that she had been born and generally hated the fact I had become a father. I guess I knew it was PND because for me it felt different to depression which I had experienced for years on and off prior to my wife getting pregnant. This was all related to my daughter and triggered from the birth. In terms of seeking help, I did go to the doctor but I mostly did everything on my own. Since I have a history of depression it means I also know it can be beaten. I talked to my wife constantly, kept working on my bond and eventually things got better. It took a long time but things slowly turned around. My advice for others is to just talk about it. Once you start talking things get better. I went a step further and started a blog purely to talk about it. But just talk to your partner and seek help if you need it. Things do get better. I want to thank everyone who has shared their journey with me for this blog. It’s vital to read these accounts to raise awareness and promote acceptance that its ok not to be ok at times. I really hope that in reading their experiences, we all realise a few important things about mental health. Family and friends (the rights friends) will never judge you and will support your journey. Talking is so important. Getting the thoughts out of your head and hearing them can make all the difference and sharing them with someone you trust is a huge part in recovery. Try to be aware of your own mental state. I knew I was detaching from my life but I chose to ignore it and I feel that the delay in getting help made things worse for me. Knowing your triggers and signs is important when it comes to addressing issues early. It’s not failing to ask for help. Most people need medical intervention and that’s fine. Don’t fight it, just accept the life vest if you are drowning not just for your sake but for your family too. It WILL get better. It’s just temporary.